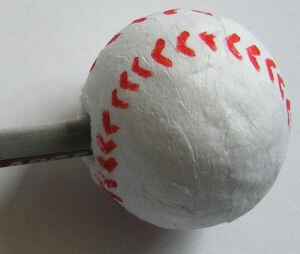 Kids can make their pencil their own with this fun baseball pencil topper for kids. It's quick to make and it looks great, too! Use the red pen to draw the stitching on the paper ball so it looks like a baseball (see the detail photo below for help). Make a hole in the paper ball, and using strong glue fix the end of your pencil into this hole. Kids who love baseball will enjoy making this baseball pennant - great for decorating a bedroom. Or make one as a gift for a baseball mad dad or granddad! Here's a simple but incredibly effective baseball plate craft for kids to make.